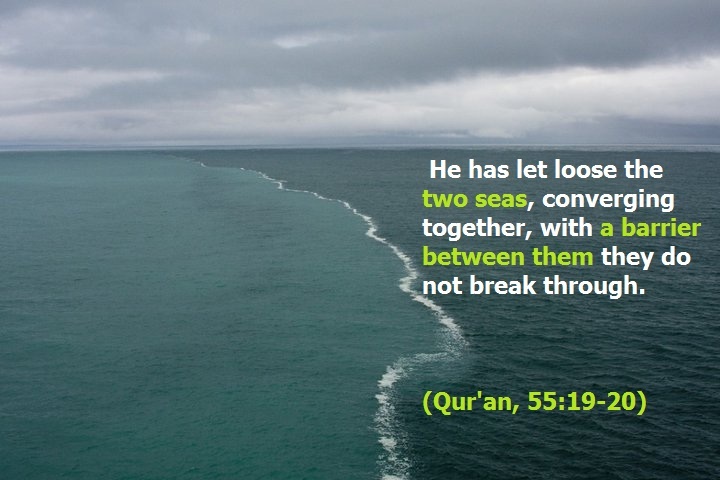 I would like to share with you ayats in the Quran that explain how the seas of this world cannot mix with each other. Now we have to remember that the Quran was revealed 1400 years ago where they did not have the technology to prove that the seas cannot intermingle. However recent oceanographer’s have proved and explained this phenomena. Oceanographer’s explain that due to the force of surface tension caused by the differences in density and salinity of two seas that meet a very thin barrier is produced that does not allow them to intermingle. Insha’Allah we all open our hearts and eyes to the words of Allah(SWT) the one and only true creator of the heavens and the earth and that we turn back to him and ask for forgiveness, guidance, protection, mercy, and to enter us all into Junnah-al-Firdaus.